All photo prints were collected and photographed by Mr. Harold Michael Shore, between 1927 and 1994. The material was donated to the City of Calgary Archives by Margaret Shore on behalf of Robert F. Shore of Lethbridge, Alberta, nephew of Harold Michael Shore in 1995. Other photo prints of Claresholm and southern Alberta, taken by M. Shore, can be found in the Lethbridge Archives. Other photo prints of the Milo area still with the family of Robert F. Shore. 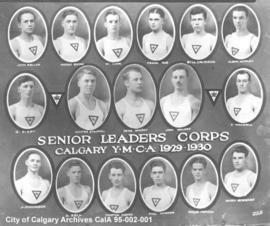 The fonds consists of photoprints of the Calgary YMCA Senior Leaders Corps; street scenes of downtown Calgary; the Calgary Normal School and Technical Institute (SAIT); the Louise Bridge; St. George's Island; the Ghost River Dam; the Canmore Cabin; the Alberta Ice Company in Bowness; the Armory; Turner Valley; E.P. Ranch; Armistice Day Parade in Calgary; the Calgary Public Library; the Claresholm Agricultural College; a class of students from the University of Alberta. Also includes a Crescent Heights High School crest and "The Chinook", the yearbook of the Calgary Normal School, 1935-1936 and a short biography of Harold Shore, written by Robert F. Shore, Harold Shore's nephew.